Fire danger in open space is a real threat, especially during the height of fire season in summer and fall. Illegal campsites are a contributing factor to fires in our local open space and you can help the San Rafael Fire Department and Police Department to help protect our community and preserve open space from potential fires. Include Latitude and Longitude - If you and come across a campsite in open space, use your smart phone to record the latitude and longitude so we can find it easily. 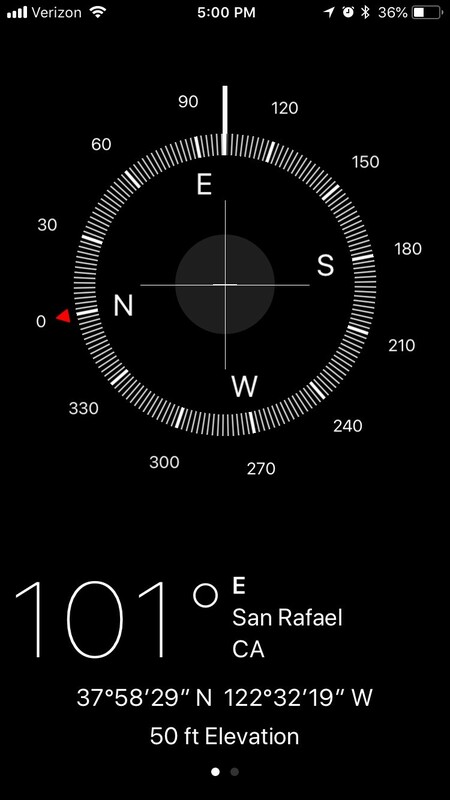 A screen shot from a smart phone compass app can help us locate exactly where you were. What is the City of San Rafael Doing to Prevent Fires in Open Space? Open Space Rangers routinely patrol the hills searching for signs of camping activity. Once a site is found, the Ranger will cite offenders if present. If no one is present, the City is required by law to post the site, similar to an eviction notice, and give occupants time to move their property from the open space. If the property is not removed according to the notice, the City coordinates the removal of the property. See below for data related to prevention of unlawful camping activity in the open space areas of San Rafael. Click into the tiles to see historical data going back to July 2014. For example, in the two weeks prior to the fire on Robert Dollar Hill, Department of Public Works crews removed 17 separate homeless camps and around 8 tons of debris located in the area where the fire started. Community outreach with HOAs and other community organizations and encouraging the certification of Fire Wise Communities in local neighborhoods. Contact us if you want to coordinate a presentation to your neighborhood group. Work with the Marin County Fire Department to identify and enforce vegetation fire hazards on private properties in the unincorporated areas of San Rafael. Collaboration with Marin County Forest Watch Fire Detection Camera System on Mt. Tamalpais.